This article is based on work I did as part of a course at Lancaster University a few years ago. It was prompted by the recollections of my grandmother Hannah Kitt of her time as a maid in Preston at the turn of the last century. She travelled south from the family farm at Haverigg on the Cumberland coast near Millom to seek work in Preston, there being none for a 14-year-old female on the farm or in the neighbourhood. What particularly struck me was that she said domestic work was easily obtained in Preston because local women regarded such work as demeaning: they found employment in the town’s cotton mills eminently preferable, being both better paid and much less socially isolating. Work in the mills was, in that sense, empowering for women, giving them an income of their own and access to a sisterhood. The empowerment was obviously relative: they were still exploited in countless ways. In highlighting the Moon family, this preliminary sketch has painted a too glowing picture of the career of a door-to-door life insurance salesman. The Pru was an undeniably successful commercial venture, and it included amongst its staff many striking individuals in the mould of John Moon. But these individuals were striking because they stood out from the great mass of the workforce: they were exceptions and in no way typical. And it is the typical rather than the special that is of most interest to the social historian who wants to uncover the life of the common man rather than write a colourful biography. Few shared the single-minded determination that propelled the Moons from illiterate poverty to respectable affluence. What was life like for the less successful who never rose from the ranks of the house-to-house collectors? The difficulty is to uncover their story since they left few records. They seldom appear in the many histories of British insurance companies that have appeared, which tend to be hagiographic and slight or institutional and weighty (more than half a stone for Trebilcock’s two-volume history of the Phoenix! ). The friendly societies, whose representatives competed for business street by street with the insurance company agents, have a worthy historian in Gosden , but he too tends to the institutional, as was noted by D’Cruze and Turnbull in their paper on Oddfellow’s lodges in Preston and Lancaster. They, in fact, suggest a way into the lives of the ordinary agent when they focus on the membership of individual lodges, going on to comb the census enumerators’ returns to reveal the social composition of the lodges. Such a strategy can be adopted for a study of the Prudential agents in Preston since, from 1869, they appear in the business directories for the town. The directories furnish a great deal of information about those agents – such as their occupations before joining the Pru and after leaving the company – and such information is greatly augmented from the census enumerators’ returns, parish records and from the Pru’s own archives. These sources enable a partial reconstruction of the life and career of another insurance family, the Luteners, who emerged from a similar background to the Moons, except that they never succeeded in amassing a fortune from their occupation. The key figure is Joseph Lutener who worked as a Pru agent for more than forty years. His father John Lutner was the first-born child of the marriage of John and Mary Lutner; John senior being described as a reedmaker. The child was baptised in Walton-le-Dale on October 30, 1803, his parents having been married in the same place in the January of the same year. In the marriage register the father is named as John Lutener, such spelling variation suggesting he was illiterate. Young John is next found in the census returns for Preston 1851, now living in Meadow Street in the town, aged 47, and working as a power loom overlooker. His eldest son Joseph, the future insurance agent, was at this time a 19-year-old weaver. Census returns reveal that John Lutener left the cotton mill and himself became an insurance agent: towards the end of his life in 1871, when he was still living in Meadow Street, he was describing himself as a retired assurance agent and supplementing his income by taking in a lodger. Joseph’s life can be followed in more detail because his long career with the Pru means he appears in the company’s pension register. This reveals that he joined the company in 1862, when he would have been aged 30, and stayed with it until he retired, aged 72, in 1904 on a company pension. When we first meet him, in the 1851 census, he is living with his parents at 39 Meadow Street, by 1869 he is married and living at number 26 Meadow Street with a young family, four years later he has moved to number 23 where he remained until sometime before 1889, by which time he has moved just round the corner into East View, where he was still living at the end of the century. Note: family reconstructions in this article were based chiefly on census and trade directory sources, consulted several years ago, which have not been detailed here, but can be supplied by emailing prestonhistory1@gmail.com. However, far more records are now available courtesy of Ancestry and that site will probably provide the most information on individual families. The Lutener family’s fortunes can at best be described as ‘middling’, they show none of the dramatic rise found with the Moons. But Joseph Lutener is no more typical of the general run of ‘industrial’ insurance agents, at least in Preston, than is his more successful colleague John Moon, because the sources show that the vast majority of the men from Pru stayed only a short while with the company and few remained fixed at a particular address as did the Luteners. Before looking at the lives of these ‘typical’ agents, it is worth sketching in the economic background against which they pursued their search for a regular income. The 1860s were singularly inauspicious years in which to launch a career as an insurance agent seeking custom from the working class in Preston. It was the time of the cotton famine when hands were being laid off throughout the town and customers with sufficient confidence in the future to undertake a long-term weekly commitment would have been few and far between. In fact, only a handful of agents seem to have been recruited and they would appear to have been driven by want of work rather than the promise of a lucrative career. They would have most likely been recruited by John Moon senior, who by this time was superintendent for the Pru based in Manchester and responsible for an area of the North-West that included Preston. By the end of the decade the town’s cotton industry had recovered and was flourishing: the employment position is disclosed in the occupational section of the 1881 census report that records that of the town’s 96,537 population some 25,909 workers were employed in the cotton industry – well over half the available workforce. Cotton dominated the town and guaranteed employment to thousands. Unfortunately for male workers, opportunities were far from equal. The requirements of the cotton industry had shifted as the century progressed – power looms had completed the automation of the weaving industry and there was much less need for skilled workers, thus women were welcomed and men found that few opportunities were open to them. As Nigel Morgan comments, ‘Power-loom weaving was mainly women’s work although in 1851 only just over half of the cotton workers were women, by 1881 two-thirds of them were women; and by 1901 , three-quarters …’  In the face of such inescapable economic realities, men were left to shift for themselves, especially since those employed in the next largest category of worker, domestic servants, were almost all women (2,389 women and only 37 men were so employed in 1881, for example, according to the census). How were men to secure the regular work that alone guaranteed security? The above figures suggest there would be thousands of male former mill workers searching for jobs with little other manufacturing work available. They would be excluded from other skilled work by the power of the craft unions and the requirement that journeymen be time-served. Where could they turn? One possibility was general labouring which, according to the census, employed 1766 workers in 1881 (only three of whom were women). This might have been seen as a step of last resort since it would have meant a reduction in income and a marked decline in social standing. Insurance work provided another such alternative. Indeed, the whole insurance industry, both ‘class’ and ‘mass’, was developing rapidly in the town during the last quarter of the century as can be seen on the map above which shows the number and location (in 500-metre squares) of insurance agents in Preston in business directories in 1869 and 1901. The heavy concentration in square 5329SE is made up almost wholly of ‘class’ agents, serving a middle-class clientele and operating from offices in the commercial centre of the town around Fishergate; the number of agents there nearly doubled in the course of some thirty years. In 1869, there were 50 agents in the central square with only another 25 throughout the rest of the town; of those outside the central business district several were also ministering to the needs of the middle-class: six in the secondary business district in Church Street to the east of the town centre, and one or two working from home from respectable middle-class addresses such as Stephenson Terrace and Wellington Terrace. Only four persons can clearly be identified as ‘industrial’ agents: the four Prudential agents, including two Luteners. This is not to suggest that there were not many more ‘collectors’ in the town, the friendly societies were not at this stage using the directories to advertise their services: the larger ones were to later. What it shows is that there was only one insurance company proper – the Prudential – with a team, small admittedly, offering a weekly collection service to its clients, and all four agents were living within a short distance of each other in the respectable working-class district around Meadow Street. 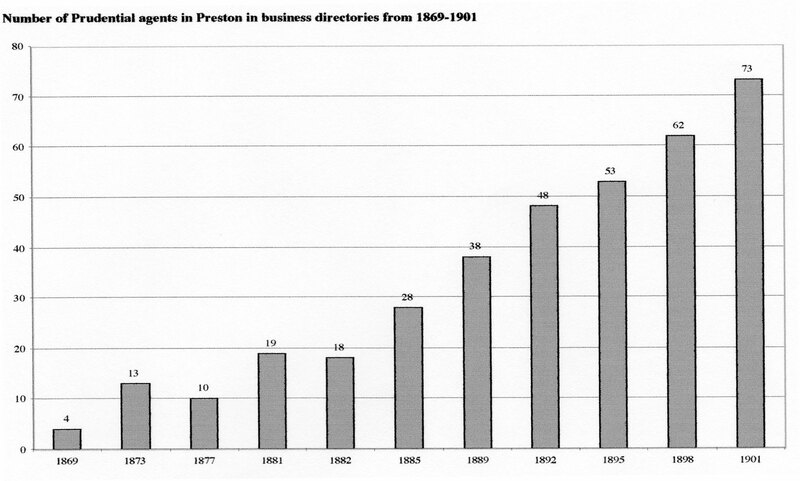 Fig 2: The distribution of insurance agents in Preston in 1901, according to the trade directory for the town published in that year. 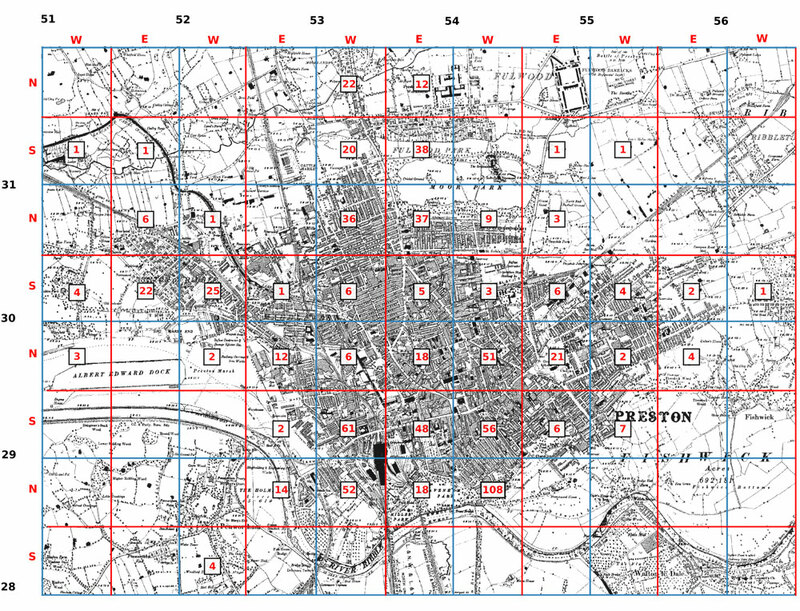 The grid is made up of 500-metre squares based on the the modern OS grid, superimposed on the 6in OS map for 1895. The address of one agent places him beyond the map boundary. By 1901 the situation had reversed with far more agents outside the central business district than were found within it. As noted, the number of agents with offices in the business district had almost doubled, but three times that number of agents, some 288, are found dotted around the town, spreading strongly into the new districts of mainly working-class terraced housing. Some 73 of them worked for the Prudential, but by this date several other companies also had teams of agents operating in the working-class districts of the town, as can be seen from the addresses of their agents listed in the trade directories. What distinguished the ‘class’ agents from their colleagues catering to the ‘mass’ side of the business, other than an office location? The distinction can perhaps be drawn by comparing the social background from which they originated or to which they aspired, using such pointers as previous occupation, the social class indicated by the occupations of their immediate family, and the district in which they lived. Looking first at an example of the ‘class’ side, the wonderfully-named Richard Samson Flowerdew would seem to be a successful representative of that side of the business since by 1901 he was agent for 27 insurance companies, more than any other agent in the town. He first appears in the directories in 1877 when he is listed as the agent for just one company: within just over ten years he was representing some 24 companies. In fact, insurance may not have been his primary concern for the alphabetical section of the 1885 Barrett directory describes him firstly as an estate agent, secondly as an insurance agent and then as an artificial manure and seed agent. Such diversity points up the generic nature of much of the commercial activity in the town in the nineteenth-century, a diversity that defies the tight constraints imposed by strict census-style classification. In the directories published earlier in the century people were categorised as ‘agents’, some of whom might specialise in a particular branch of commercial activity, but not exclusively. They were not professionally qualified, winning their clients by good connections and good character. Such a one is Richard Flowerdew, who harked back to an earlier age by continuing to conduct his business from his home in Bairstow Street rather than renting an office in nearby Fishergate or one of the neighbouring business streets. 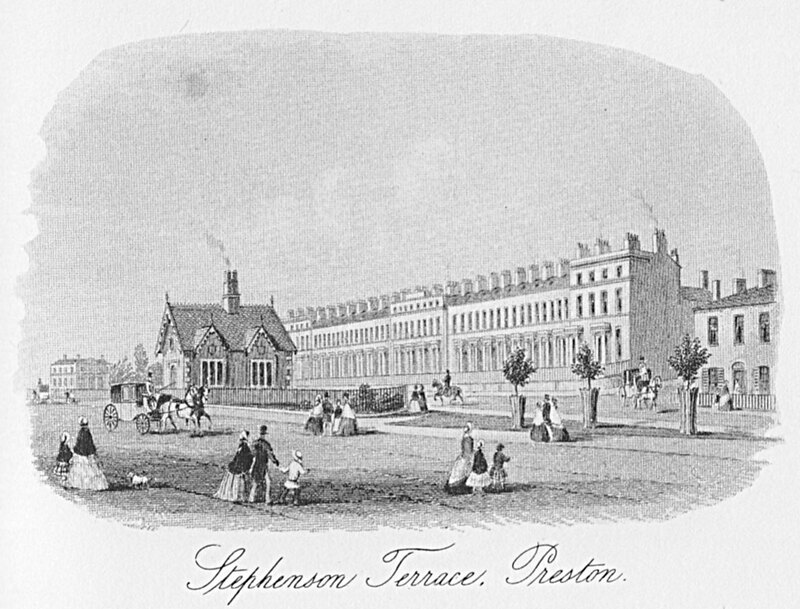 Bairstow Street was then a fashionable address and Richard and his wife lived there with one servant. Their neighbours in 1885 included the headmaster of the town’s grammar school, a curate at the parish church, a surgeon and a high bailiff, as well as two ironmongers and a pair of pawnbrokers. He was the son of Richard J. Flowerdew who arrived in Lancashire in the 1860s as estate steward to the de Hoghton family. Richard Flowerdew senior designed and built a new home for himself, Walton Hall, and established himself there in the style of a Victorian country gentleman. Given such family connections, Richard Samson Flowerdew would have moved confidently amongst the highest level of Preston’s commercial and social establishment. Such elevated circles would have been closed to the ‘industrial’ insurance agents, both socially and commercially – the middle-classes would have seen them as equivalent to door- to-door hawkers. Sir, – Last night, about dusk, as my wife was walking along a quiet suburban road with our little girl, they were suddenly confronted and brought to a standstill by a tall man of forbidding aspect, who seemed to them to assume a threatening attitude. Nor were his first words reassuring, for, in a deep guttural tone, he demanded, ‘Is your life and the child’s insured?’ Now, it is not surprising that at a time when women’s minds have been thrown into a state of nervous excitement by the East-end murders, this rencontre aroused horrible visions in my wife’s mind of ‘Jack the Ripper’; but the man was not personating that fiend, he was only a local tout of the Prudential Assurance Company with more zeal than discretion. My object in narrating this incident is to suggest that the ‘Prudential’ should, for the present at least, induce its agents to adopt less startling modes of canvassing within the Metropolitan area. The letter could, of course, have been a creative piece of industrial sabotage originating in the offices of a commercial rival, but to work it would have had to have sufficient verisimilitude to pass vigilant editorial eyes and would also have to chime with the readers’ prejudices – even if invented, it was ‘true’ in that it mirrored prevailing middle-class opinion. Presumably, such views were shared by the respectable residents of Preston’s own middle- class suburbs that had appeared to the north and west of the town. How true to the stereotype were Preston’s Prudential agents? Using contemporary sources a partial picture can be reconstructed. The period considered begins in 1869, when Pru agents first appeared in the town’s business directories, and closes, somewhat arbitrarily, in 1901. The period was dictated largely by time constraints, but was also designed to fit in with available census data. Three groups of sources will be used – the business directories, the four censuses of the period, and the Pru’s own records. Three publishers produced commercial directories in the town between 1869 and 1901. Gillett published one in 1869; Mannex published three, in 1873, 1877 and 1881; and Barrett published seven, in 1882, 1885, 1889, 1892, 1895, 1898 and 1901. Thus we have snapshots of the town every three or four years throughout the period. The Gillet directory of 1869 is the sole one issued by that publisher; it interrupts a run of Mannex directories. The Barrett edition of 1882 followed closely on the heels of the 1881 Mannex edition. The three publishers can be measured against Norton’s useful yardstick, ‘In general, when a directory is printed and published in its own locality . . . part of a series appearing regularly over a number of years, it can be expected, prima facie, to be reasonably reliable.’  This would let in Mannex and Barrett, but would hang a question mark over Gillett. George Gillett published only one directory, and that with difficulty to judge from his apology in his introduction for its long-delayed appearance. Indeed, given his other responsibilities it is surprising that he managed even one publication for in his directory he describes himself as an auctioneer, accountant, house and commission agent, and builder and cabinet maker working from 108, Fishergate and living at 12, Avenham road. Like Richard Flowerdew, and, as we shall see, many of the Pru agents, Gillett anticipated the notions of ‘multi-tasking’ and ‘portfolios of skills’ by more than a century. It is worth noting that none of this rich variety is even hinted at in the census returns. Such diversity can, of course produce a ‘Jack of all trades, master of none’, and this may have been the case with Gillett, casting doubts on the reliability of his directory. Among the four Pru agents in his directory there is no John Moon, yet the company’s pension register records place John Moon junior as assistant superintendent in Preston in 1864, when he would have been just 18, and as superintendent in 1869. Such early promotion within the organisation smacks of nepotism and it could be that young John was still living with his father in Manchester, and, at least initially, exercised an absentee responsibility for Preston. The position was reversed in 1881: he was living in Preston’s West Cliff and working as Preston superintendent yet gave his business address as Deansgate, Manchester, in the Mannex directory for that year: presumably commuting to work. One explanation for ‘missing agents’ in the Gillett directory is that the newly formed network of agents in the North-West had yet to develop the formal structure that appeared in the 1870s. In the 1860s the company’s priority would have been to find new business and Preston, as we have seen, would have offered thin pickings during the period of the cotton famine. The railways and cheap lodgings would have allowed John Moon senior to move teams of canvassers around the region seeking new custom. With the above caveats in mind, we can now look at what the directories reveal about our men from the Pru. The three publishers followed a similar pattern, dividing their directories into three sections: the first an alphabetical list of some, but far from all, inhabitants, the second a classified commercial listing, and the third a street directory. Comparison of the first two sections reveals interesting information about the Pru agents: it would seem that the information in the business section was supplied by the company (there is a uniformity in the descriptions that suggests a common source) but that in the alphabetical section varies and would seem to have been supplied by the agents themselves. The eleven directories considered demonstrate the steady growth of the Prudential’s presence in the town once the 1880s are entered. These are, of course, at best three-yearly snapshots, more revealing than the decennial census returns but still omitting a good deal of information. This is shown when we consider the length of time agents stayed with the company: the majority only appear once in the directories, many more could have had a brief career as a Prudential agent but, if this was between directories, they will not be shown. The directories reveal the names of 172 agents of whom 81 (47%) appeared only once and only one agent, Joseph Lutener, appeared in all 11 directories. If we accept that there could have been many more individuals who served briefly as Prudential agents but whose names do not figure in the directory lists, then for the vast majority it would have been a very short-lived career. Allan Todd appears as a Pru agent in 1877, five years later he is working as a friendly society agent and ten years after that he is employed as a printer. Bartholomew Eccles describes himself as ‘shopkeeper and agent for Prudential Assurance Co.’ in the Mannex directory for 1881 and as unemployed in the census for the same year; three subsequent directory entries describe him simply as shopkeeper. Daniel Callow worked briefly as a Pru agent in 1881 and 1882, then as an unattached commission agent before becoming a chapel keeper by 1898 and finally appearing as ‘living on own means’ aged 74 in the 1901 census. James Cocker makes one appearance as a Pru agent in 1873 and in the same directory describes himself as a shopkeeper and coal dealer; in other entries between 1865 and 1901 he is described as coal dealer, grocer, shopkeeper and provision dealer. James Pearson makes two appearances as a Pru agent in his fifties, prior to that he is described as a blacksmith and Baptist local preacher in the 1891 census. James William Hartley who is described as a 49-year-old cotton overlooker in the 1881 census is found 20 years later working as a Pru agent. John Armstrong Pape appears as a hairdresser aged 26 in 1877, makes one appearance as a Pru agent four years later and then is described as a hairdresser for the rest of the century. John Mansley worked briefly as a Pru agent before becoming a Liberal Party agent in his 40s and retiring by the time he was 50. John Crewe described himself in the 1901 census as a retired cotton mill overlooker but in the Barrett directory of that year is listed as a Pru agent. Moses Lutener worked for the Pru from at least 1869 until 1891, with a short career break around 1880 when he was running the Sir Walter Scott pub. In 1873 a 29-year-old Peter Thornley described himself as a ‘draper and coal and insurance agent’ and is listed as a Pru agent, then he appears in 1877 and 1881 as a draper and baby linen dealer (in the 1881 census he describes himself as ‘lnsurance Agent & Local Methodist Preacher’); by 1882 he is back as a Pru agent with no sign of his drapery business. Samuel Louthan Sandwell worked as a coach maker before becoming a Pru agent. 25-year-old Thomas Askew Hodgson was described as a cotton weaver in the 1901 census and as a Pru agent in that year’s directory. In the same year, 22-year-old Thomas Fisher appears as a telephone operator in the census and as a Pru agent in the directory. Thomas Williamson appears in the 1891 census as a 60-year-old goods guard, thereafter appearing in the directories for the next ten years as a Pru agent. William Cross, who appears in the 1877 Mannex directory working as a tailor, is recorded as a Pru agent in 1881 (when the census records him as a Methodist lay preacher) and again in 1882. William Gooch appears as a grocer in the alphabetical section of the 1895 Barrett directory, three years later he is listed as a cashier and, by 1901 is back in the grocery trade as a manager; in both 1898 and 1901 he is also listed as a Pru agent. These examples supply a glimpse into the varied lives of the Pru agents. It is skewed by the absence of such groups as labourers, servants and unemployed from the directories: the bias would thus be expected to be in a socially upward direction, yet there seems little evidence of social advancement in the above examples. More compelling support for such a conclusion comes from an examination of the agent’s households as revealed in census returns: household details for 120 of the 172 agents in our group were examined, in all but a handful the Pro agent is the head of household. It seemed that the employment of the offspring in the households might supply an indication of the families’ social aspirations. Of the 119 sons, employment details were supplied for 40 (the rest were either described as scholars or no description was given but their ages indicated they were too young to be employed). The figures show: manual cotton industry jobs (9), other manual trades (9), apprentices in manual trades (7), clerks (7), errand boys (4), auctioneer (1), assurance agent (1), pupil teacher (1), theology student (1). Of the 165 daughters, employment details are available for 72 (of the rest all but 10 were of school age or under). The figures show: manual cotton industry jobs (48), garment industry (16), teacher (2), shopkeeper (2), shop assistant (2), biscuit worker (I), midwife (1). These figures suggest two points: the children of Pru agents seemed destined for working-class careers; and the cotton industry and the garment trade together were the most likely occupational route for women (89% of our 72) but much less so for young men (17.5% of our 40). Resident domestic servants were employed in only six of the 120 households examined. In two their employment suggests domestic necessity: one was a widower with a nine-year-old daughter who employed a housekeeper and the other household comprised two bachelor brothers in their 20s living in an expensive house in Fulwood. In another the Pru agent is a junior member of a household that is headed by a self-employed accountant. In a fourth the household head is an assistant superintendent with the Pru. Of the final two, one describes himself as an auctioneer and valuer and the other as a jam manufacturer – neither seem likely Pru agents. Indeed, the jam manufacturer, Ernest Newsome, was one of the first businessmen in the town to have a telephone line installed, and by 1901 had a second line installed at his home address. Aside from these last two anomalies, it becomes clear that Preston’s men from the Pru were almost invariably recruited from the ranks of the respectable working class – the very people whose custom they were seeking. It would seem from the account so far that women played little part in the Pru organisation. There are only two women among the 172 agents, one of whom, Mrs Elizabeth Marshall, first appears in the 1881 census as the 40-year-old wife of Pru agent William Foxcroft Marshall; by the next census she is widowed and describing herself as a Pru agent and employing her l3-year-old son Albert as a collector. She appears in subsequent trade directories as a Pru agent until 1898 when she is in the alphabetical section but with no occupational description, suggesting she has retired. Albert, meanwhile, had married and left home and was working as a Pru agent on his own account. The fact that Elizabeth could take over her husband’s role, apparently successfully, and the early involvement of Albert in the business, suggests that Pru agencies could be run as family concerns even though only the man’s name appears in the records. Indeed, they would lend themselves to such diversified organisation since they generated a great deal of paper work, weekly collections had to be made and new customers recruited. This would mean that the census returns could be highly misleading since of the 103 wives in the census material studied only nine are described as having paid occupations. Of the rest 12 are described as doing housework, one as living on own means and 81 are given no description whatsoever. It seems likely that many of them were far more gainfully employed than would appear from their bare census description – the Pru could supply them the means to both raise their families and contribute to the family income. The age distribution of the Pru agents accords with Lawson’s findings in her study of Plungington shopkeepers, suggesting that such occupations supplied an income for older men unable or unwilling to secure employment in the cotton industry. Figures compiled for each of the 11 directories studied (based on ages revealed by census entries) shows the mean age of Pru agents ranged from 39 to 45 and the median age from 37 to 47. There was little deviation in any of the years from 1869 to 1901. Intuitively, one would expect that the Pru agents, being predominantly middle-aged heads of households the members of which tended to take working-class jobs, would live in working-class districts where the housing would be affordable and their customers were most likely to be found. One would not expect to find them in middle-class districts. The difficulty, for Preston at least, is that the town’s organic development early in the nineteenth century resulted in different classes living in close proximity – a nineteenth-century Prestonian would have no difficulty distinguishing addresses, it is far harder looking back from over a century on. Two approaches have been adopted to address this problem. Firstly, the addresses of some 502 journeymen were extracted from the 1885 Barrett’s directory and plotted on a map of Preston: the ‘journeyman’ title seemed a clearly unambiguous description of respectable working-class status since it indicates time-served, waged workmen, who could be expected to congregate in working-class districts. Secondly, towards the end of the century greater social stratification is found in the town with the establishment of firmly middle-class enclaves in Fulwood and Ashton. The Fulwood Park community has been closely studied, notably by Boxall who used census returns to reconstruct the area’s social geography and found that, the ‘predominance of manufacturers and shopkeepers illustrate a trend that the Park was encouraging, namely the separation of home from workplace.’  Fulwood Park was the district to which successful businessmen aspired. We would expect many Pru agents in the journeyman districts, few in Fulwood Park. Fig 5: The distribution of journeymen addresses in Preston in 1885, according to the trade directory for the town published in that year. 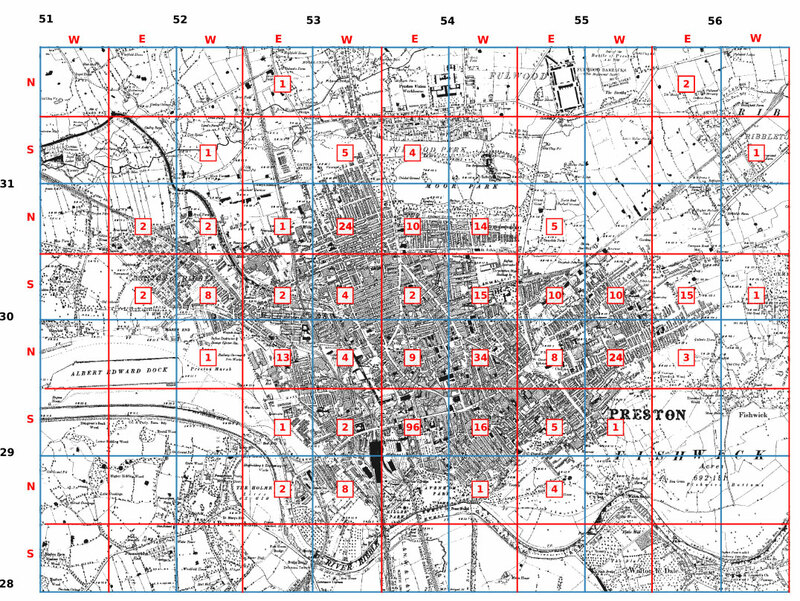 The grid is made up of 500-metre squares based on the the modern OS grid, superimposed on the 6in OS map for 1895. 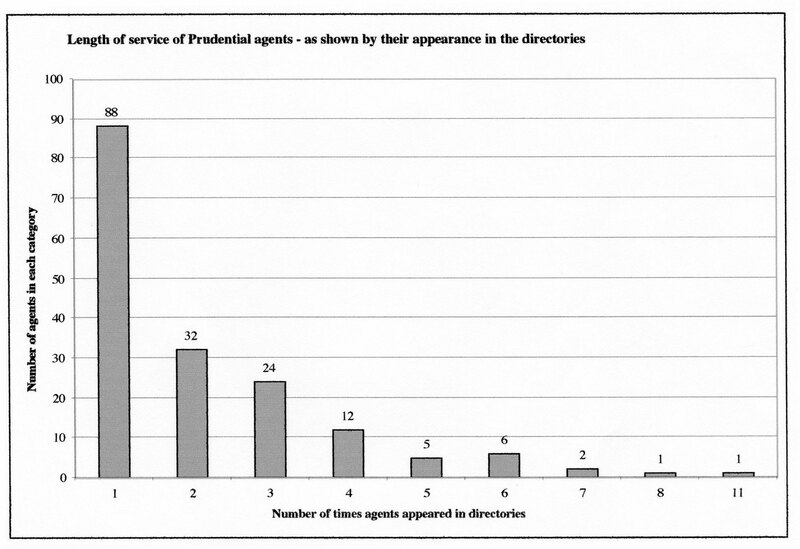 Fig 6: The aggregated numbers of addresses of Pru agents taken from the trade directories for the town between 1869 and 1901. The grid is made up of 500-metre squares based on the the modern OS grid, superimposed on the 6in OS map for 1895. Fig 7: The distribution of ‘middle-class’ addresses in Preston in 1885, according to data extracted from the trade directory for the town published in that year. 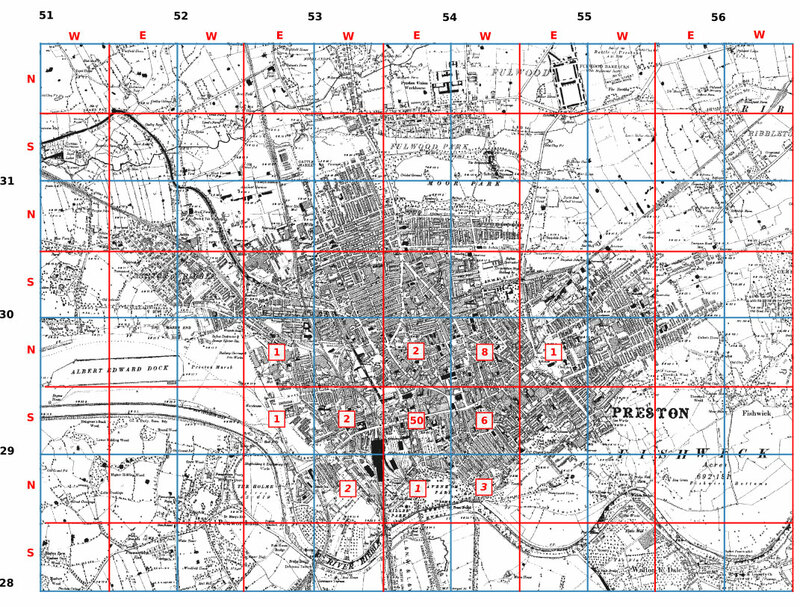 The grid is made up of 500-metre squares based on the the modern OS grid, superimposed on the 6in OS map for 1895. The maps above llustrate the result of assigning all the addresses of Pru agents in the 11 directories studied to 500-metre squares and comparing them with the distribution of the addresses of journeymen and middle-class residents in 1885. The methodology for this procedure is considered in more detail here: https://prestonhistory.com/sources-2/preston-trade-directories/trade-directories-as-a-source-for-preston-history/. There does seem to be a correspondence in the groupings of Pru agents and journeymen, suggesting that Pru agents did indeed live in the same working-class districts as their customers. Some of the discrepancies are easily explained: there are no journeymen in square 5530SE because that area was only completed at the end of the century – all but one of the Pru agents are found there only after 1892; the discrepancy in square 5430NW is similarly explained by the end-of-the-century, eastward development of working-class housing south of Moor Park. The one major, unexplained discrepancy is in square 5429SW where there are 54 journeymen but only 6 Pru agents. The numbers of both journeymen and Pru agents thin out to the north beyond the Plungington to Deepdale concentrations in squares 5330NW, 5330NE and 5430NW; northwards takes us into middle-class territory across Moor Park. North of the 31 gridline only three, widely separated journeymen addresses are plotted, whereas there are 19 Pru agent plottings. The most clearly demarcated middle-class district is Fulwood Park in which Pru agent addresses are plotted 7 times. These refer to four agents, three are among the handful of households with domestic servants we considered earlier, and the fourth is an agent who moved to the district shortly before retiring after more than 25 years with the company. It appears then that Pru agents living in middle-class districts were strongly atypical: the agents knew their place and, almost invariably, stuck to it. The place of Pru agents in nineteenth-century Preston is thus a world away from the careers of insurance agents portrayed in most histories of insurance companies. There were few of the ‘rags to riches’ family chronicles beloved of biographers – the Moons were a rare mutation – and a great social divide separated the ‘class’ agents typified by Richard Flowerdew from the mass of door-to-door agents selling ‘mass’ insurance (a divide that the census reports paper over). 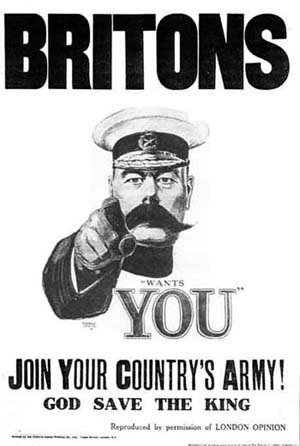 Rather, Pru agents were recruited from the same ranks that supplied Lawson’s shopkeepers – working-class males seeking any form of income in a town in which the dominant cotton industry offered them few opportunities. They sought custom amongst their own social class, which frequently proved a precarious expedient. At the end of the century the cotton industry offered easy access to employment for women, but left men to shift for themselves. It would be interesting to study the other groups of occupations besides insurance selling and shopkeeping which recruited from this pool of thousands of working-class males, and how transitory that recruitment was. Such a study would be greatly assisted by the business directories, which supply reliable and accurate information about the town’s population at frequent intervals. L. Dennett, A Sense of Security: 150 Years of Prudential (Cambridge: Granta, 1998). D. Morrah, A History of Industrial Life Assurance (London: George Allen and Unwin, 1955). Dennett, A Sense of Security: 150 Years of Prudential, 132. H. A. L. Cockerell and E. Green, The British Insurance Business . . . a Guide to Its History and Records, 2nd ed. (Sheffield: Shefﬁeld Academic Press, 1994), 67. Dennett, A Sense of Security: 150 Years of Prudential, 69. ‘Moon Family Papers’, n.d., Prudential Archives. C. Trebilcock, Phoenix Assurance and the Development of British Insurance, 2 vols (Cambridge University Press, 1985). P. H. J. H. Gosden, The Friendly Societies in England 1815-1875 (Manchester University Press, 1961); P. H. J. H. Gosden, Self-Help: Voluntary Associations in the 19th Century (London: Batsford, 1973). S. D’Cruze and J. Turnbull, ‘Fellowship and Family: Oddfellows’ Lodges in Preston and Lancaster, c.1830-c.1890’, Urban History 22, no. 1 (1995): 25–47. ‘Pension Registers’, n.d., 1444, vol 6, Prudential Archives. Dennett, A Sense of Security: 150 Years of Prudential, 57. Nigel Morgan, Vanished Dwellings (Preston: Mullion Books, 1990), 21. Elizabeth Zoe Lawson, ‘Working-Class Shopkeeping in Preston 1860-1890’ (Diploma in Local History dissertation, Lancaster University, 1989), 23. J. Benson, The Penny Capitalists: A Study of Nineteenth-Century Working-Class Entrepreneurs (Dublin: Gill and Macmillan, 1983). Dennett, A Sense of Security: 150 Years of Prudential, 395. J. E. Norton, Guide to the National and Provincial Directories of England and Wales, Excluding London, Published before 1856 (London: Royal Historical Society, 1950), 16. Lawson, ‘Working-Class Shopkeeping in Preston 1860-1890’. J. Boxall, ‘Suburbanisation: Fulwood Park, Preston, 1850-1890s’ (University of Central Lancashire, MA dissertation, 1997), 70.